Pick’s was originally opened in 1923 as a Reed & Bell Root Beer Refreshery and has been a local favorite in Cloverdale ever since. Serving much of the same menu it did when it opened, “Big Daddy” cheese burgers, french fries, grill cheese sandwiches, and milkshakes, the quality of the food as notably gone up since David Alioto (Healdsburger) purchased the restaurant last year. It’s great to see a classic independent eatery with great food and a friendly staff hold its own in this corporate 21st Century world. 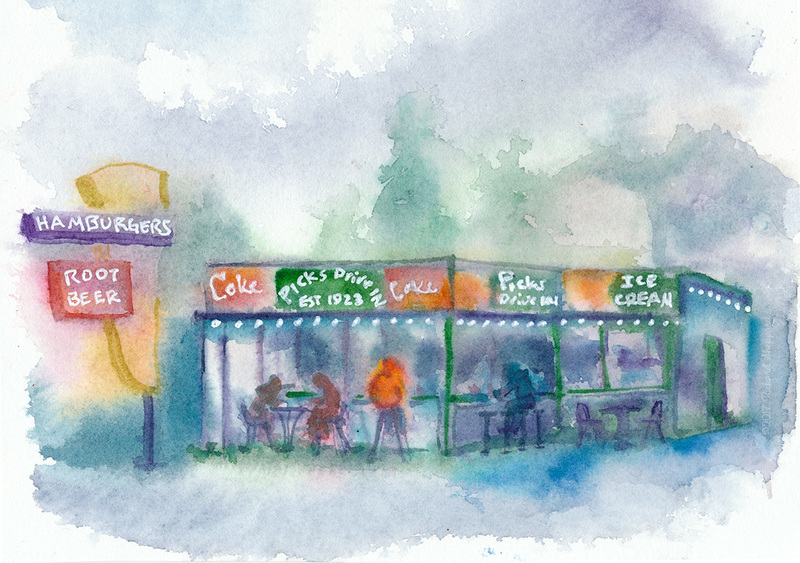 I started this sketch standing across the street from the Drive In until the rain drove me indoors to finish. Watercolor on Arches hot press paper and uni-ball Signo white ink pen. February 20, 2017 Richard SheppardComments are off for this post.